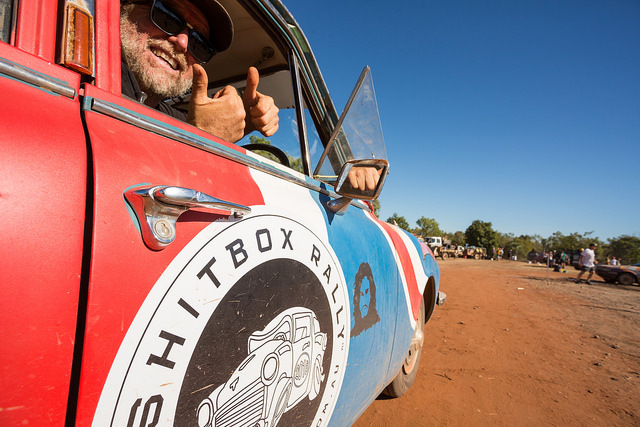 Shitbox Rally 2019 Autumn will be held May 8th to May 17th , travelling from Perth to Sydney via Uluru. 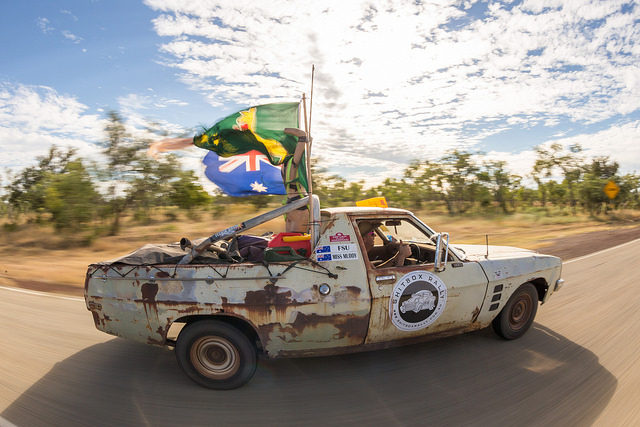 Shitbox Rally is not a race, rather a challenge to achieve the unthinkable… To drive cars worth just $1,000 across Australia via some of its most formidable roads, all in the name of charity. Trust us – this is going to be great fun. Sure, it’s not for everyone. Those who don’t like to get their hands dirty or spend any time away from civilisation need not apply. For the rest of us, it may just be what you’ve been looking for. 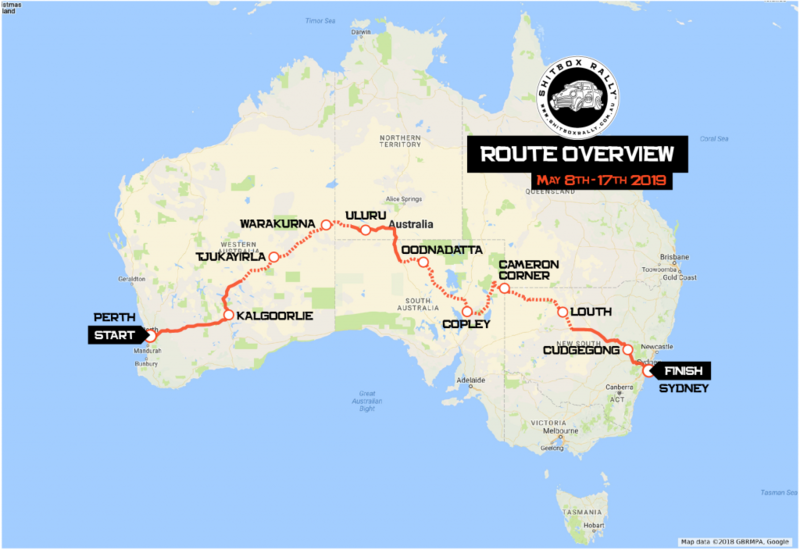 This rally is for those who want to have an adventure, who crave something different, something memorable, but most importantly, it’s for those who want to raise much needed money for charity. Many of us have been affected by cancer in one way or another. Whether it be parents, family, close friends, people we know or ourselves that have battled or are battling cancer, this awful disease has touched us all. We not only want to raise awareness and money for Cancer Council, but also want to offer support and a friendly ear to those that have suffered or are suffering. This event is officially endorsed and supported by Cancer Council. Each two-person team needs to raise a minimum of $5,000 (but hopefully a lot more) to participate in the rally. As there are two of you, it’s only $2,500 each. Once you’ve raised your minimum amount, you’re given up to $500 back to go towards the cost of your car. Teams are also provided with a $500 fuel budget. Anything above $500 comes out of your pocket. We want to keep the costs to participants down as much as we can. Our teams put remarkable efforts into fundraising, which is why we help cover some of the costs for the car and fuel. We work hard to keep any other costs to you as low as possible. The registration fee goes towards all your rally merchandise, support and important safety items. Each team is made up of two drivers and one car. This is because we may need all the extra room we can get for passengers of machines that don’t manage the entire journey. We’re only able to take a certain number of people on the journey, so by keeping to only two people per team, we can get more teams into the rally. All teams need to raise a minimum of $5,000 to participate in the rally, or $2,500 each driver. 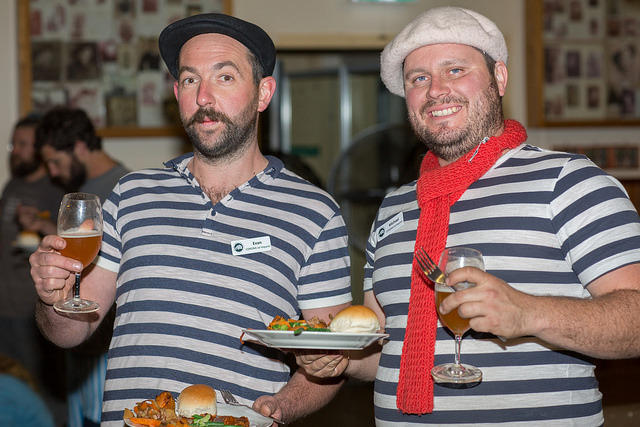 So start badgering your friends, work colleagues, and family, and brainstorm some fun ways to boost your fundraising. Cancer Council have helpful fundraising tips in a Welcome Pack which they provide. We’ll also let you in on a few fundraising hot tips that we know work well. Throughout the the year, we’ll be in contact with you, providing monthly newsletter updates on everything from fundraising to route conditions and how the other teams are going. 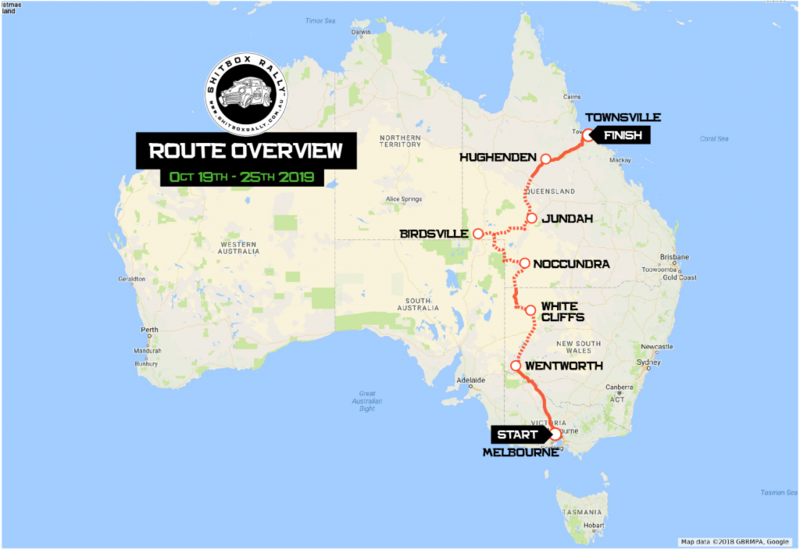 Everyone will have a direct line to the Rally Director, who’ll make sure you have all of the information you need to fundraise and will support you all the way to the start line. The only stipulations we have for your car are that it’s worth/valued at no more than AUS$1,000 and that it’s not an AWD/4WD vehicle. Registration/roadworthy aren’t included the budget, as well as some safety items. We’ll give you more details about what does and doesn’t count once you’ve signed up. There are plenty of cars on carsguide.com.au and gumtree.com.au for $1,000 or less with some registration remaining. 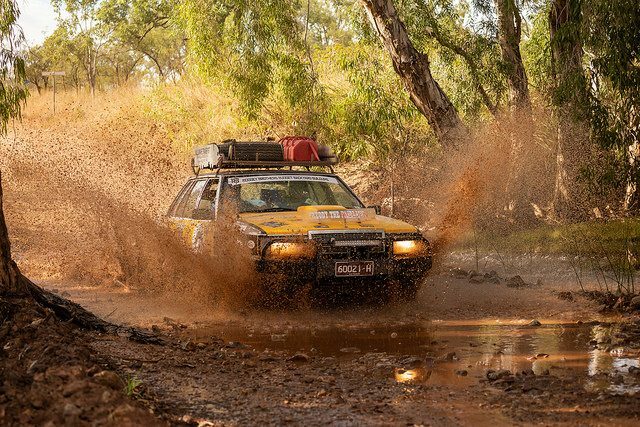 Get creative and turn up in something that’s truly memorable – it’ll make the adventure that much more rewarding when you are in the middle of Australia, miles from anywhere and you’re trying to fix a split water pipe with duct tape, string and pliers. The cars are an asset that we’ll auction off or donate at the end of the rally, so getting all of the cars across the line is very important to us. We’ll all work together to get as many shitboxes from start to finish as possible. This trip is not about creature comforts. It’s a challenge, and it’ll be dirty, dusty, maybe muddy, and tough. But it’s going to be an amazing experience and something that you’ll remember forever. We will be camping at all stopovers, so you’ll need to bring your own tent, sleeping bag and mattress or swag. The two nights after we complete the rally, we stay in hotels. Participants enjoy discounted rates and we’ll provide you with the booking details soon after you’ve signed up. During the rally, we organise (where possible) all of your meals and camping at the stopovers. Before we start, you’ll receive an itinerary with a list of what we’ll be doing at each place and any costs that you need to factor in. You’ll get plenty of advanced notice before departure if you need to take care of your own lunches, etc. IS IT A RACE AND CAN I WIN? No, it’s not a race, but yes, you can win. Prizes are awarded at the end of the rally. 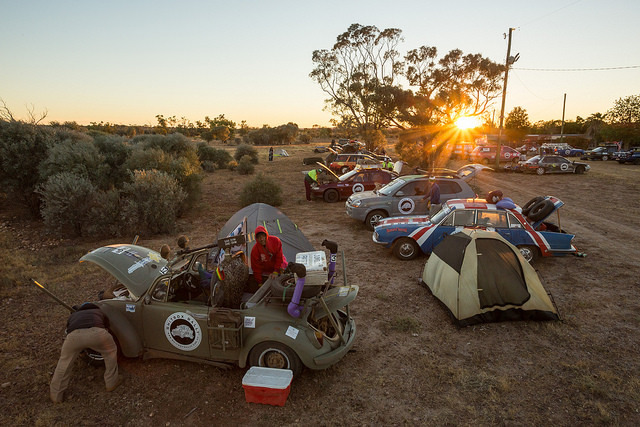 The main prize, or first place if you’re competitive, will be judged on a range of factors, including how hopeless your car is, how much you’ve embodied the rally spirit, and how much money your team raised. There’s also likely to be a number of other undisclosed factors that the Rally Director will generally make up as the rally unfolds.